I think the Supreme Court has got it right by saying that parts of the Scottish ‘named person’ scheme are contrary to the right to privacy and family life. The named person scheme looks far too much like that other information sharing initiative, ContactPoint, for my liking. The fundamental flaw in such schemes is that they assume that just because information was not shared in a particular tragic case, ensuring that similar information is available to a wide range of professionals and officials routinely will avoid a similar tragedy in the future. That is just ‘hindsight bias’ – seeing a past event as having been predictable, despite there being little or no objective basis for predicting it. And there is absolutely no evidence to suggest that information sharing (particularly on an industrial scale) in itself protects children. Just because a ‘fact’ is written down in a file or a database field, doesn’t mean that it is appreciated, understood and acted upon. Indeed, not being able to see the wood for the trees is a major problem when everybody is told everything. Far better, in my view, to look at problems of communication in child protection. Why is it that some important messages are not sent or not received or not understood? We don’t need national policies to start tackling those issues and the impact on making children safer would be much greater than having a free for all with sharing sensitive information. The consultation paper has just been published and I am working my way through it slowly and carefully. There is a summary in Community Care. What follows is based on my own first read-through. The paper proposes two alternative ways forward in addition to the status quo: introducing mandatory reporting with sanctions for failing to report or, alternatively, a duty to act - either placed on individuals or organisations - which would require certain practitioners or organisations to take appropriate action (which could include reporting) if they knew or had reasonable cause to suspect child abuse or neglect was taking place. My starting position is as follows. I am in favour of all professionals, practitioners and other people, including members of the public, being advised that they should always report child abuse and neglect. I am not, however, in favour of sanctions, including the possibility of criminal convictions, when people fail to report. Likewise, I believe we all have a duty to act to protect children, but I don’t think punishing people who fail in that duty is likely to have any positive effect. The vast majority of people who work with children do not want to see them abused and neglected. It is only a very small minority of people who work with children who either do not care or who are active participants in abuse. Often these people are already committing offences, such as assisting offenders, misconduct in a public office, conspiring to pervert the cause of justice or offences of actually harming and abusing children themselves. The vast majority of people who fail to report abuse or neglect do so not because they are wicked or negligent, but because they make genuine mistakes or misjudgements, sometimes convincing themselves in the face of apparent evidence to the contrary that the abuse or neglect is not happening. Failing to report abuse is usually not an egregious act – it is usually an error albeit sometimes a very serious error. I do not believe that people who make errors – no matter how serious the consequences – while acting in good faith should suffer punishment or sanction. They may need advice or guidance or re-training or even moving to different duties, but they shouldn’t be sent to prison. Inevitably introducing offences surrounding failing to report abuse and neglect, or failing to act to protect a child, would result in a climate of fear among those who were covered by the legislation. That would not make them safer employees, because it would make them practice more defensively, to be less likely to discuss why things have gone wrong and be more likely to refuse to co-operate with enquiries or investigations because they might incriminate themselves. As a result, the organisations for which they work would become more opaque. People would be less likely to be open about error, they would be less likely to discuss their mistakes, they would be less likely to learn from them or the mistakes of others. In short practice would become less safe. Children would be at greater, not lesser, risk. Children) is substantially higher than the rate in some countries which have mandatory reporting systems: USA (47.1 per 1,000 children); Australia (37.8 per 1,000 children). All of this seems to me to signal the need for very great caution indeed. To my mind risks 4, 5, 6 and 7 make the case for not introducing mandatory reporting unassailable. In particular risk number 5 is my main concern – the risk that organisations and practice will become less safe, because people fear that they may be punished if they admit to making mistakes and so will not speak openly about error nor learn from it. Some parts of the consultation paper seem to be carefully drafted. Others I thought were sloppy and illustrative of how a mandatory reporting system could easily become arbitrary and illogical. For example, Table 1 on pages 19-20 lists local authority social workers as a group who could be covered by legislation, but it makes no mention of their managers, some of whom may not be professionally qualified social workers. Nor does it mention social workers employed by other organisations such as CAFCASS or adoption agencies. The same table suggests that the only doctors to be covered by the legislation would be GPs and Paediatricians and makes no mention of other doctors who clearly have key roles in child protection, such as child and adult psychiatrists, A&E doctors, orthopaedic surgeons, dermatologists, urologists etc. etc. Dentists are not mentioned at all. Nor are child psychologists. Nor are psychiatric nurses. People such as prison governors and prison officers, who may hear about child abuse from prison inmates, receive no mention either. Domestic violence support workers probably hear quite a lot about child abuse and neglect in the course of their work, but they are not mentioned. Housing officers are mentioned, but not public health officers. What about border force officers or school bus drivers or scout leaders? There is no mention of the military. And surely the sad history of the Jimmy Savile case should signal a need to include people involved with children’s involvement in entertainment being included, if anybody is. People go to their MPs with allegations of child abuse, so shouldn’t MPs be required to report as well? The real danger here is that once the logic of a mandatory reporting system is explored, there seems to be an almost inevitable pressure to include more and more groups. Indeed, the end point of the argument may be that if anybody is to be made a mandatory reporter than everybody should be. The effects of that are anybody’s guess. This consultation paper is very important. Everybody concerned with safeguarding and protecting children from abuse and neglect should read it and make an individual response or contribute to a collective one. The very last thing we want is for Government to introduce unnecessary changes which have negative unintended consequences and which result in services, and most importantly children, who are less safe as a result. Ofsted’s chief, Sir Michael Wilshaw, and the inspectorate’s Head of Social Care, Eleanor Schooling, have been giving evidence to the House of Commons Education Committee. There is a nice summary of the event in Children and Young People Now. When asked why so many children’s services departments were ‘inadequate’ Sir Michael had one clear answer for which he produced, as far as I could see, no cogent argument. It was leadership, leadership and leadership (or rather lack of good leaders) that was the problem. According to Sir Michael, running children’s services successfully was just common sense. You made sure that you had enough social workers and checked that agency workers were properly developed and trained. And, of course, all the case files had to be up to date and the thresholds clear and transparent. Assessments had to be “appropriate” (whatever that means) and timely. It was as simple as that! And yet those people in children’s services, according to Sir Michael, kept “getting it wrong again, and again, and again”. What was the matter with them? Perhaps Directors went to too many conferences and didn’t visit the front line often enough? Note the lack of evidence for all this. But as Sir Michael pointed out, it is well known that good schools are good because they have good head teachers (just as he had been) and he clearly thought the same logic applied in children’s social care. That other ex-head teacher, Eleanor Schooling, ploughed on in a similar way. She put forward the argument that effective early intervention leads to fewer children in care, which, she thought, means that good authorities had more money to spend on services other than looked after children. In addition to providing no evidence for her case she did not explain how an authority which has to support a larger than average number of children in care can move to being an authority which has pots of money to spend on early intervention. How that interesting transition is achieved remained completely obscure. To her credit Schooling was opposed to big caseloads – apparently up to 40 cases per social worker in the worst instances have been witnessed by her inspectors – but how small caseloads (ideally less than 10) were achievable, given staffing and resource shortfalls, was not explained. Both speakers seemed to feel that resources weren’t an issue. They said there were lots of examples of cash-strapped councils which had good services. But again there was no explanation of why or how this came about. I struggled to imagine how an authority could reduce its caseloads from 40 to under 10 without some extra resources going in somewhere. “You can’t get owt for nowt” as they say in thermodynamics. I was left with no clear impression about how an ‘inadequate’ authority could be helped to become ‘good’. Sir Michael mentioned Birmingham disparagingly and despairingly but gave no clue about what he thought the largest local authority in Europe should do to save its chronically struggling children’s services. I expect he thinks it needs yet more new leaders! It is the lack of real ANALYSIS that really worries me about the whole Ofsted approach to social care inspection. There is too much judgement and too little attempt to articulate and understand the problems. Anybody who agrees with Sir Michael that running child protection services is just ‘common sense’ needs to think again. Child protection services are complex professional services which are safety critical. Systems and processes to safeguard and protect children are complex and there is huge scope for unintended and unexpected outcomes. Motivating and retaining the right people is very difficult. Achieving real quality improvements is challenging. The system is under great pressure because of high demand and reduced resources. And the whole thing takes place in an environment dominated by a culture of recrimination and blame. You need more than common sense to steer those treacherous waters. Those are the words which a child protection social worker writing in Community Care used to describe herself. She considers herself a “veteran” in child protection. Very few other social workers have stuck the course as long as she has, she says. How long has she been working in child protection? Eight years – yes eight years! Of course it is not survey or a research finding – it’s just the personal report of one person – but research does support the view that eight years is a long time in child protection social work . And it is a graphic way of putting it – “long in the tooth” she says! We really have to get to grips with this issue. A profession that burns out its members in under 10 years is always going to struggle. It will struggle because the initial training cost per post will be unrealistically high. It will struggle to find sufficient new recruits. It will struggle because the proportion of recently qualified people in the workforce will be very large. It will struggle to find mentors and senior practitioners. It will struggle to deepen the pool of professional learning and experience. It will struggle to provide continuity to service users. If this new government had any sense it would prioritise RETENTION of social workers in child protection. But I don’t expect it will … hey ho! Curtis L, Moriarty J and Netten A (2010), ‘The expected working life of a social worker’. British Journal of Social Work 40(5), 1628-1643. We all want safer child protection services – i.e. services in which disasters and other unwanted outcomes are ever less likely to happen. 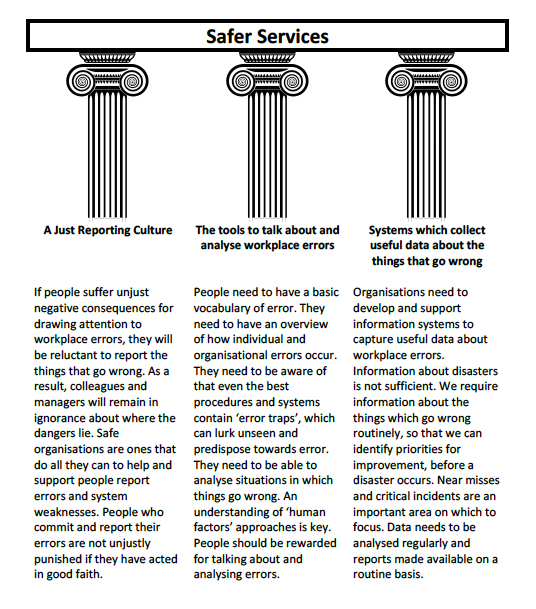 Safer services are supported by three pillars – Greek or Roman columns perhaps? Building the three pillars of safety supports the roof of safer services. Unlike Greek or Roman columns, however, these pillars do not need to be very ornate. What counts is not the decoration but the basic approach. And we can build these pillars up from below to support the services we already have. We don’t need a new roof, just a better supported one. We could start building these pillars tomorrow – if only we could grasp the opportunity and stop being distracted by other things which do not support safer services and safer children.